The ‘967 patent is aptly named “Battle school” because it deals with a lesser-explored kind of game—the educational game. The invention describes a type of game whereby two players can engage in battle against each other. Unlike traditional games, however, after a user selects an attack, he is asked a question by the other user. If the first player answers the question correctly, his character performs an effective attack. The type of question asked by the user may be pre-selected from a list, or created by the user, but it is supposed to be a question related to a certain educational topic. 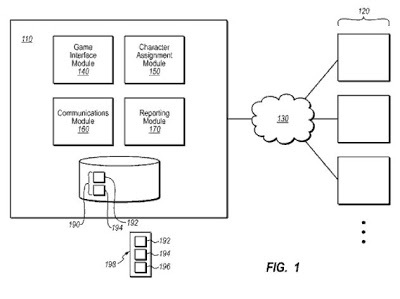 Interesting concept described in this patent, how it will be applied will be something to surely keep track of. Educational materials are presented in the format of games such as role-playing where participants progress through game storylines within a game environment. Each game participant is assigned a game character having unique and dynamic attributes that can be modified as the character progresses through the game storylines. The characters encounter challenges and participate in game actions that require the participant to answer questions that correspond to educational materials that are contextually unrelated to the game storylines. In order to successfully modify a character’s attributes, obtain possessions for the character, progress through the storyline, to be successful in battle sequences or to obtain a desired reward, the participants must correctly answer the questions they are presented. To obtain a successful result, it is also sometimes necessary for a participant to recruit other participants having different assigned characters with different attributes to collaborate and work with the participant. 1. A method for presenting and testing educational materials within a computer game environment in which multiple human participants play the role of assigned virtual game characters that engage in battle sequences within the game environment and wherein the success of battle attacks and defensive actions involving the assigned characters during the battle sequences within the game environment are determined by a combination of assigned strengths, weaknesses and attributes of the assigned virtual game characters, as well as types of questions asked and the answers given by the multiple human participants that reflect personal mastery of the educational materials, the method comprising: identifying a plurality of virtual game characters, corresponding to a virtual game environment, that are stored on a computing system and that each comprise a corresponding and unique set of game attributes that include at least an attack attribute and a defense attribute for participating in a battle sequence involving at least two virtual game characters within the virtual game environment; assigning a first virtual game character to a first human participant from a pool of available virtual game characters; assigning a second virtual game character to a second human participant from the pool of available virtual game characters; presenting the virtual game environment on the computing system with the first virtual game character in a storyline and that includes game actions that the first virtual game character participates in, and wherein the game actions include at least one of modifying the unique set of attributes that correspond to the first virtual game character, obtaining possessions for the first virtual game character, and/or using the first virtual game character to interact with a second virtual game character that is assigned to a second human participant; identifying rules that define battle between the first and second virtual game characters, wherein said rules define types of questions that can be asked by the first and second human participants to initiate an attack with one or more virtual weapons wielded by the first and second virtual game characters during the battle within the virtual game environment and a potential for inflicting battle damage during the attack with the one or more virtual weapons, wherein battle damage comprises a reduction of one or more character attributes, and wherein the types of questions that can be asked and the potential for damage is based at least in part on the defined attack and defense attributes of the first and second virtual game characters; presenting questions to the first human participant through the virtual game environment when the first virtual game character participates in particular game actions within the virtual game environment, wherein at least some of the presented questions are educational questions, which correspond to educational materials, and that are provided at least in part by the second human participant submitting one or more particular questions, wherein the one or more particular questions that can be submitted by the second human participant are limited to the attack attribute of the second virtual game character and are at least restricted to less than all questions that are available to be asked during battle by all of the available virtual game characters, and wherein said educational questions also correspond to one or more virtual battle attacks that are preformed with a virtual weapon and that are directed to the first virtual game character within the virtual game environment and that originate from the second virtual game character assigned to the second human participant, and wherein the first human participant defends the first virtual game character from the one or more attacks by answering said educational questions correctly; rewarding the first virtual game character with a positive outcome to the particular game action within the virtual game environment for correct answers received from the first human participant in a response to the presented questions, including at least successfully defending the first virtual game character from suffering battle damage resulting from the one or more attacks by the virtual weapon within the virtual game environment, and wherein the battle damage comprises a reduction of at least one character attribute of at least the first or second character in the virtual game environment; and assessing mastery of the educational materials by the first human participant, wherein assessing mastery of the educational materials is based on an evaluation of rewards received by the first virtual game character within the virtual game environment and by evaluating progress of the first virtual game character within the game, which includes an evaluation of whether the one or more attacks are successfully defended.